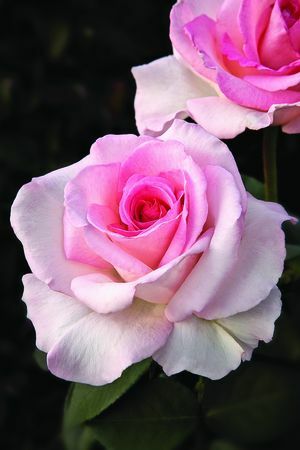 This 2009 winner is a classic Hybrid Tea that has the whole package: high centered bud, long stems perfect for cutting, very soft shade of pale pink, and sweet fragrance. Pink Promise has been chosen to represent the National Breast Cancer Foundation as they search for the cure. A percentage of each plant sold will benefit the foundation. This rose performs best in California and other dry, warm climates. Will require tender loving care in other parts of the country. Pink blend. Flowers pink blend, smooth, veined. Mild to strong, opinions vary fragrance. 25 to 30 petals. Average diameter 4″. Medium, double (17-25 petals), borne mostly solitary, high-centered bloom form. Blooms in flushes throughout the season. Medium. Large, semi-glossy, dark green foliage. Height of up to 42″ (up to 105 cm).